It’s the season for weddings at the moment, and it’s certainly a busy time for some of our clients who are in the wedding and honeymoon business, such as Hothorpe Hall and Deer Park Country Hotel. Our Interior Designer Flo (now the new Mrs. Kentish) has recently returned from her own honeymoon and being the creative sort, she styled her wedding herself. When someone who designs the interiors for treehouses gets married, you know the wedding is going to have that wow factor! Decide on your theme and style first: This will influence all of the other decisions you make, so it’s best to make this a priority. The very first thing I did after getting engaged was to set up a shared Pinterest board between my friends and family so we could start collecting ideas. 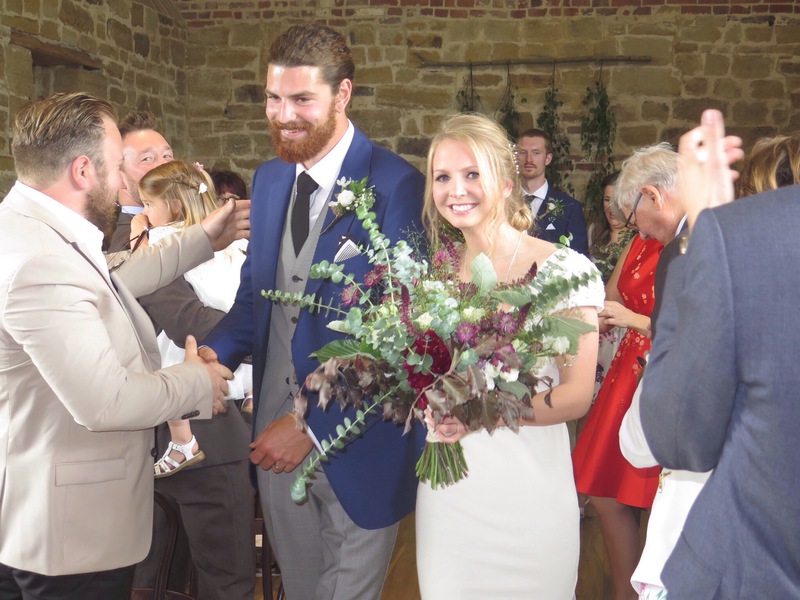 We knew straight away that we wanted a woodland, country wedding – we spend our spare time outdoors, Chris is an Oak Joiner and I design treehouses so a woodland theme reflected who we are as a couple perfectly. Choose your venue next: The venue will affect a lot of things, from how many people you will be able to invite, to your overall spending budget. But most importantly, it should reflect the style and feel of the day. We have a large extended family and the idea of having a small venue was out of the question. We decided to get in touch with Beautiful World Tents who provided us with an incredible Tipi set up within the grounds of Chris’s family home. It was exactly what we wanted – spacious, rustic, outdoorsy, but still close to home and family focused. We made the space work for us, as we could decorate it however we liked and could move tables and chairs to make more room for dancing at the end of the evening. DIY to make your wedding completely unique: Because I did so much of the decorating myself, I knew that there wouldn’t be another wedding quite like it. Chris made oak board platters by hand for the Italian antipasti sharing starters. Delicate paper cones were filled with our own handmade dried flower petals for confetti which were given out to our guests. All of the signs were hand painted by us. We made a coconut shy outside and an outdoor cinema using a bed sheet strung from the trees, hay bales and a festoon canopy. We built the bar ourselves using pallet boards and wood, and we renovated a reclaimed wardrobe to store glasses and drinks in. Three glasses of prosecco, Andy?? Discover your friend’s and families talents and celebrate them: We felt like the most important thing was to celebrate our marriage with our friends and family and the day was made all the more special by having everyone contribute. My childhood family friend did our flowers for us (white for the bridal party, plum for the grooms party, and my bouquet was a mix of both colours with some greys mixed in), a close friend of Chris’ Mum made our gluten-free cake for us, our friend offered his professional services as our photographer and another family friend lent us their classic Bentley and even offered to act as a driver. Our friends from Pizzeria Apollo came to make authentic wood oven pizzas for our guests later on in the evening. We spent weeks building that outdoor pizza oven but it was worth it! We of course had to book one of the groomsmen and his band John Bull and The Bandits for our entertainment. Bryony Blake, my sister in-law, is a professional make up artist so I would never think of booking anyone else to do my bridal makeup. My hair piece was made for me especially by my friend Kerrie Kent, who owns her own bridal hair accessories company Rusty Mayfair. Don’t go OTT – find your favourites and make them amazing: Finding your wedding dress can be overwhelming, as there are so many designs out there but there are a few things you can keep in mind to make the process easier. Firstly, set a budget for your dress right at the beginning, and don’t look at anything unless it’s within that budget – that will help narrow down your options. Secondly, for a woodland theme, think about what sort of fabrics are going to be appropriate – speak with the dress consultant to see which fabrics are going to work best in an outdoor environment. Try and book an appointment first thing, so that the consultants are ready to go with a clear mind rather than having one at the end of the day. The dress I picked was the Irune dress by Atelier Pronovias from Leonie Claire Bridal Boutique in Brighton – a beautiful cut but simple enough for me to add my own details. Leonie added a bespoke waist belt and embroidery going down the back – the embellishments created a completely individual dress. Let the finer details enforce the theme: I wanted to make sure that the woodand theme came across the strongest in the smaller details. The theme was used throughout, from the invitations right through to the venue decorations. We used Eucalyptus, Hazel and Willow branches picked from the garden for the tables, walls and ceilings – and I also wrapped some branches around hoops to hang from the edges of the tipi. I used Elderflower sprigs to decorate the cake. We chose to have long tables and benches rather than individual round tables, to make the evening feel more communal and relaxed. For the main meal we had carve-your-own slow cooked lamb smothered in salsa verde and large Foccacia bread in the middle of the tables for everyone to share – a bit like a Viking feast! The large plates & rustic Oak platters were rested on cut logs in the middle of the tables above the decorations. My mother made the rustic table runners and napkins, which I tied with string and used hand printed name tags and herbs from the garden to decorate. Use your creativity and be resourceful: I love being creative in my job and we really wanted to challenge ourselves to see what we could incorporate into our wedding. We literally raided our parent’s lofts for some cool finds, and were lucky enough to stumble across a beautiful old typewriter and vintage suitcase which we left on the entrance table for our guests to type notes for us. We wrapped fairy lights around the rustic timber poles inside the Tipi and we also put balls of fairy lights into Kilner jars to give our venue a bit of atmosphere in the evening. We used whiskey tumblers as tea light holders, and used old Hendricks Gin bottles for candle stick holders on the tables. My final piece of advice is to just enjoy the whole experience and try not to stress and panic. Things will go wrong, the catering staff might not turn up and the weather might not be on your side, but there’s always a solution. It will be an amazing day either way – the rain made our wedding feel more cosy and fun so there is always a positive. Chris and I would like to say a big thank you to everyone who contributed and helped to make our day extra special.